The employees of our local hospital came up with this recipe for several pies and I sized it down to make one pie. I used sugar-free instant pudding and fruit, low-fat milk and made my own crust with sweetener making this something to eat in small portions for a diabetic or for those on a low-fat diet. 1. Place all ingredients in mixing bowl and with an electric mixer beat until stiff and mixture holds soft peaks (If you are adding fruit or coconut, gently fold into mixture at this point). 2. 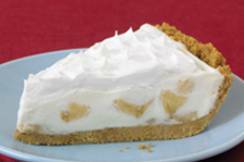 Spoon mixture into graham cracker crust and top with Dream Whip® whipped topping or Cool Whip®. Refrigerate pie until ready to serve. Start out beating ingredients on a lower speed so it doesn't splatter and then a higher speed when it starts to stiffen. If using vanilla pudding, you can add bananas, coconut or drained pineapple. We like to mix pineapple and coconut. Makes 1 pie, 8 servings.